(My (very mediocre) makeup collection photos are online. Thank you and YAY for the makeup collection! Going to go over and look at your post now! Very nice. I like the black background. Thank you! It’s really in how I processed it because our table is just regular… medium brown wood and I shot these all in the kitchen lol. Well, as per usual, your photos are exquisite. 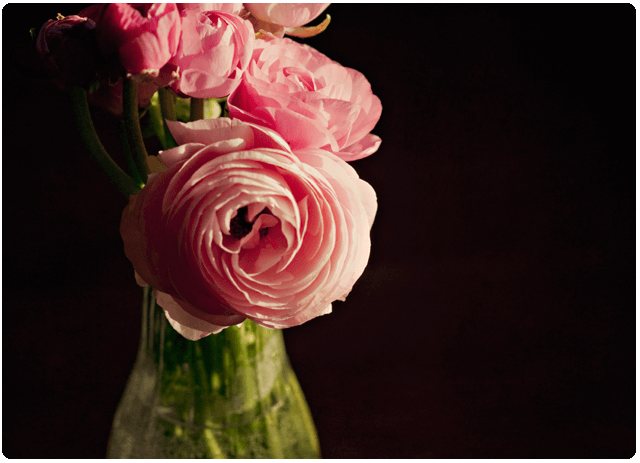 Ranunculus are my FAVORITE. I need to find out if I can grow them here in New England. These are beautiful! It’s the first time I’ve bought them and they are just so lovely! I can’t wait until I can buy some peonies as those look sooo fluffy. I’m sure you can grow them in New England, generally midwest-east are better gardening climates rather than say, Arizona lol. Thank you! It actually was harder than I thought to shoot them because well… 1. the kitchen table wasn’t cleaned off lol and 2. the light was VERY VERY direct and bright but I think I lucked out overall with some decent photos. Gorgeous! Gorgeous!! So glad you linked up to WW! Sweet! Thank you so much Alicia! This is beautiful!!!! I love the back backgrounds against the pink flowers! 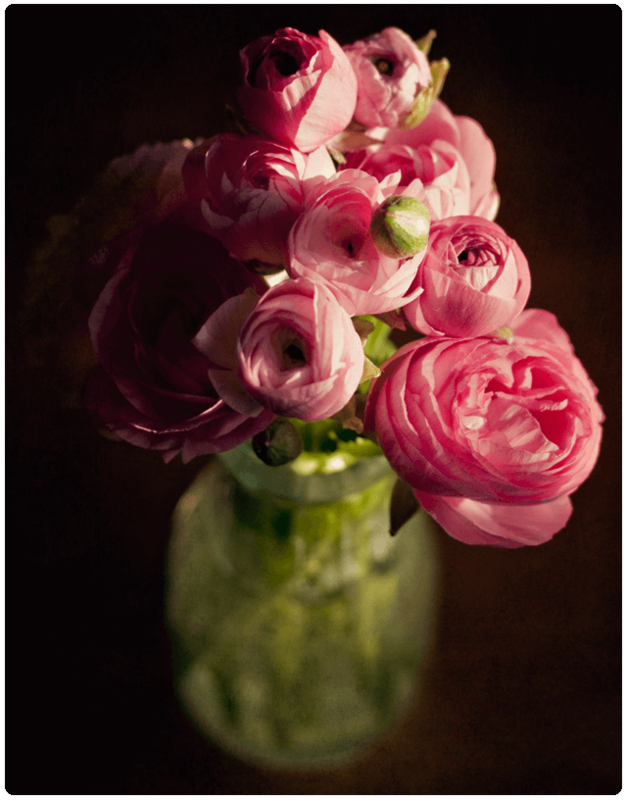 Oh, I love ranunculus! 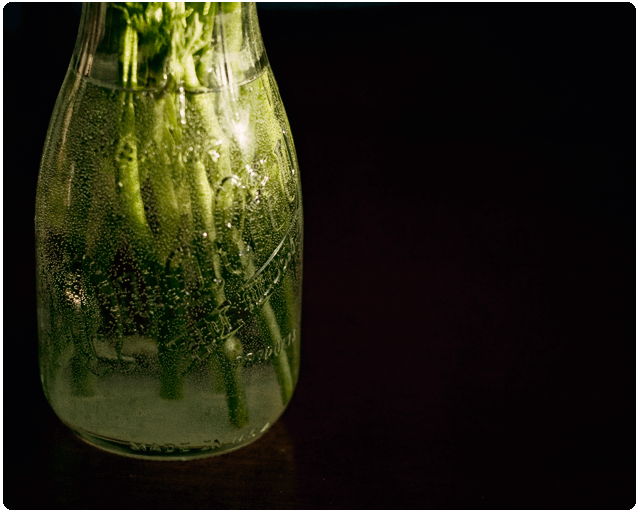 And that last photo of just the vase and water is exquisite in its unexpected simplicity. Thanks for sharing your pictures! Thank you so much! They remind me of roses but more… fluffy lol. I have some flowers this week too…even a pink one. Lovely series. The pinks and greens are wonderful. Thank you! I couldn’t agree more, the colors are so SPRINGY to me! These are gorgeous! You constantly inspire me. I’d love to grow these beautiful flowers, but as bad as my record is with the regular flowers, I’m not convinced that I’d have any success. So I’ll just enjoy your gorgeous photos! Aww thank you! 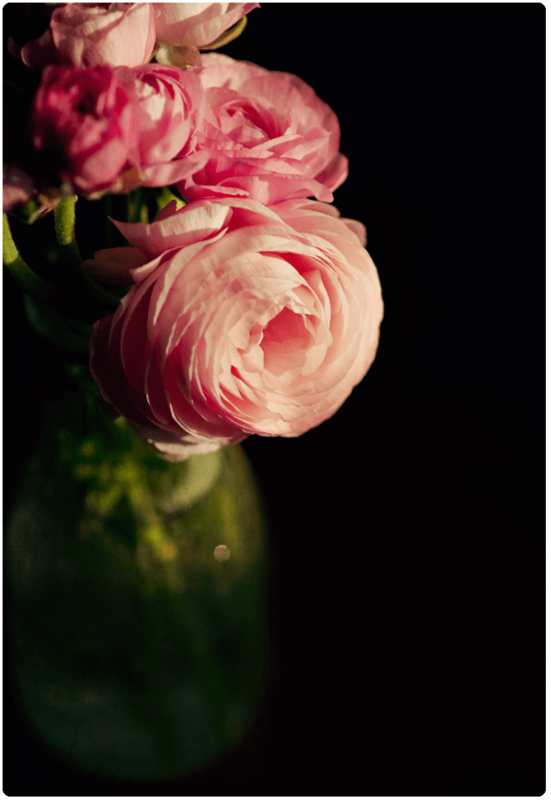 I would love to grow these, peonies, and roses, but I just… don’t know how to landscape lol. LOL thank you!!! I’m hoping to go to the Botanic Garden soon (we need to renew our membership this month anyway! ), to get some new bloom shots! Oh Sarah, these are so gorgeous! 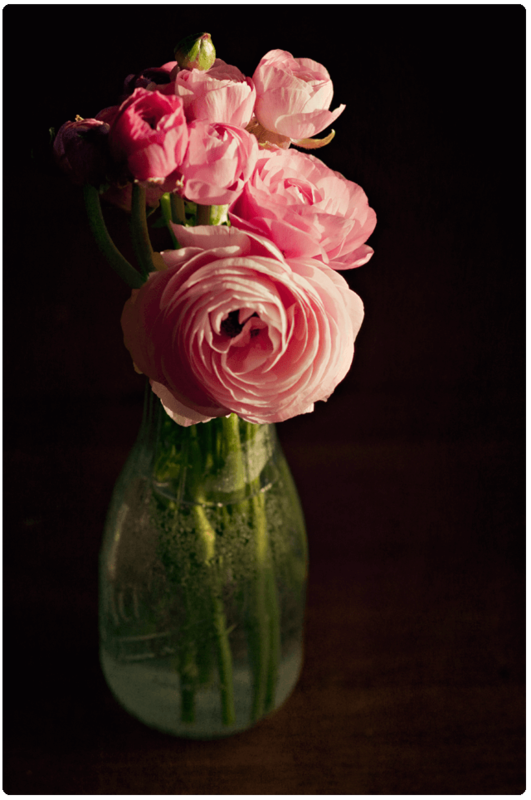 The flowers are my absolute favs and your photos are simply stunning. Finally back in France in a house with an internet connection. Thank you!!! OH I bet you went through internet withdrawal lol. These flowers really got an exotic look! Amazing shots!